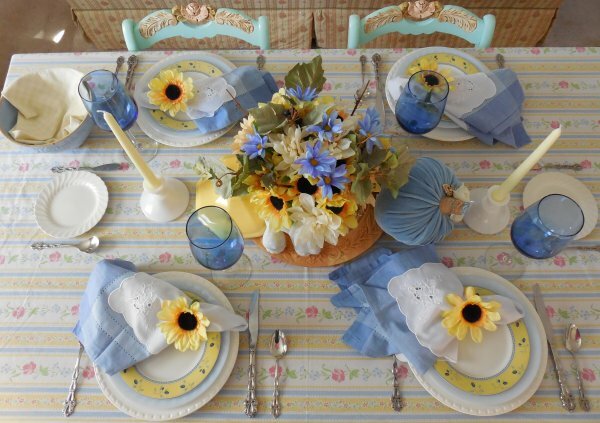 I set this Provence-inspired blue and yellow table late last Summer and somehow never did a blog post about it! I can hardly believe that myself, because it very quickly became one of my favorites! 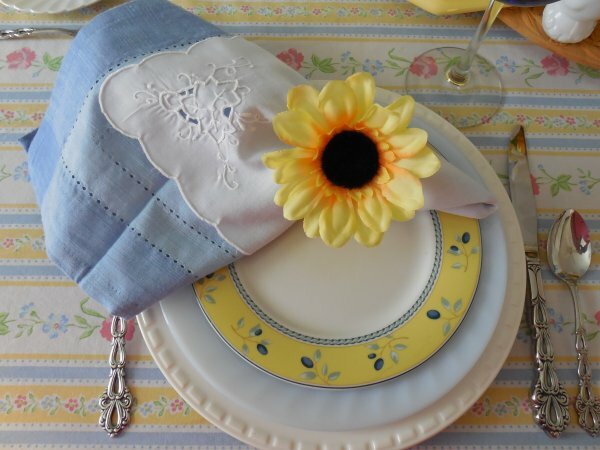 Maybe it’s best that I didn’t share it until January – we need all this sunny, summery blue and yellow right about now! 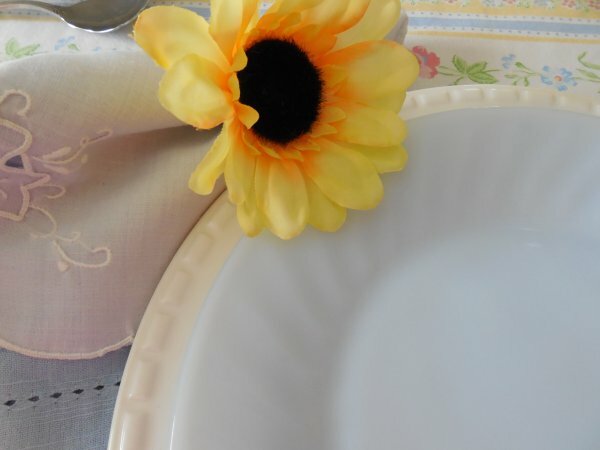 Love pretty tables set on a budget? 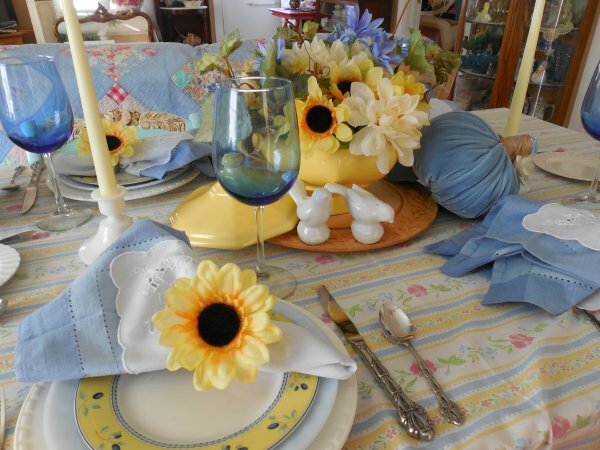 Please join me over in my Facebook Group, Thrifty Tablescapers, and let’s share tablescaping ideas! 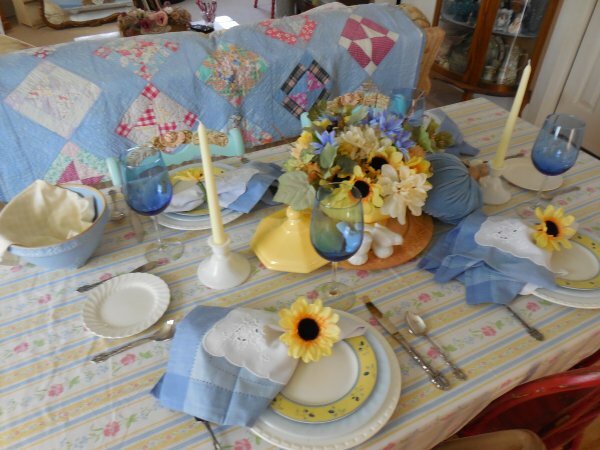 I am a huge fan of using flat sheets for tablecloths – I collect them from thrift stores (after checking carefully for stains, of course!) and have a dresser drawer full. 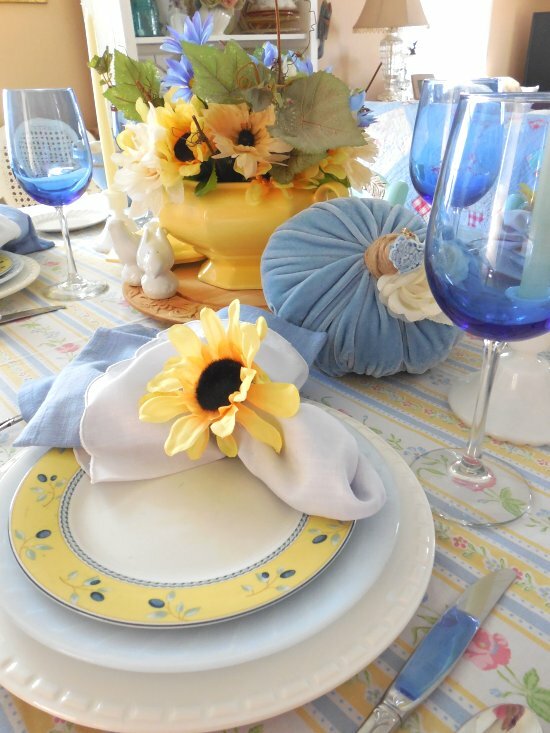 This one is twin-size and incorporates the blue, yellow, and white color scheme perfectly – with dashes of pink thrown in because why not! 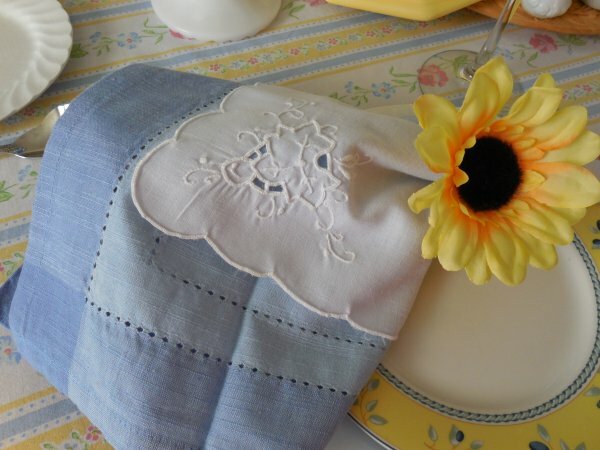 Napkins are blue hemstitch from the clearance bin at Pier 1, with an outer layer of smaller, white cutwork napkins so the blue doesn’t overwhelm. 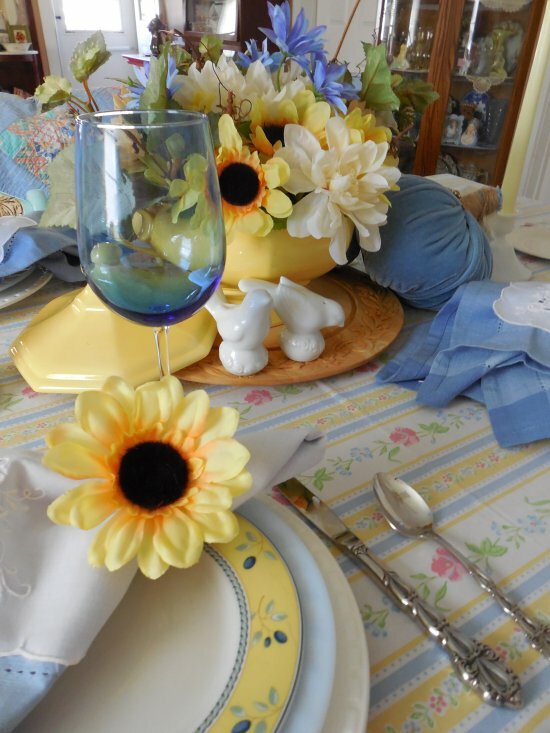 Napkin rings are a combination of rings from a Pier 1 set and yellow sunflowers popped off a stem from Dollar Tree. 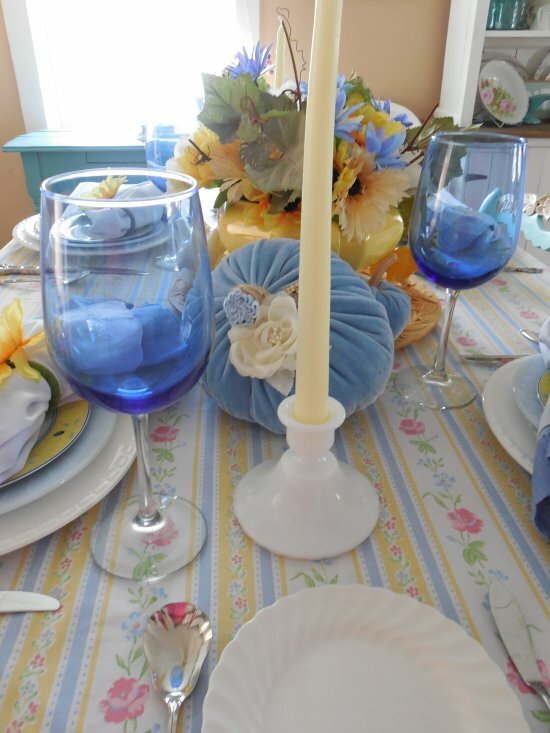 The pretty blue stemware is also from Dollar Tree. 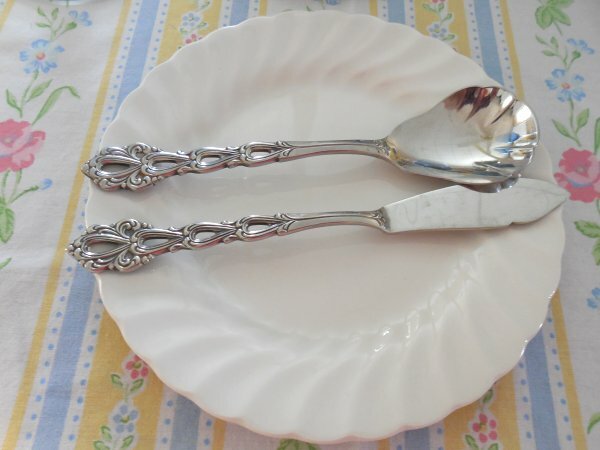 For flatware, I used my treasured Oneida “Chandelier,” a gift from my grandmother and the same set we used in her sister’s (my great-Aunt’s) home for holidays when I was growing up. 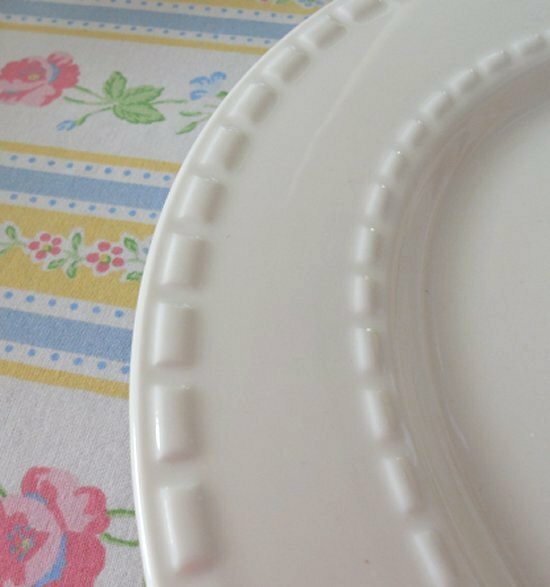 Candlesticks are simple milk glass pieces acquired at Goodwill, and I’ve also set a white dessert plate in a pretty swirl pattern to be used for butter. 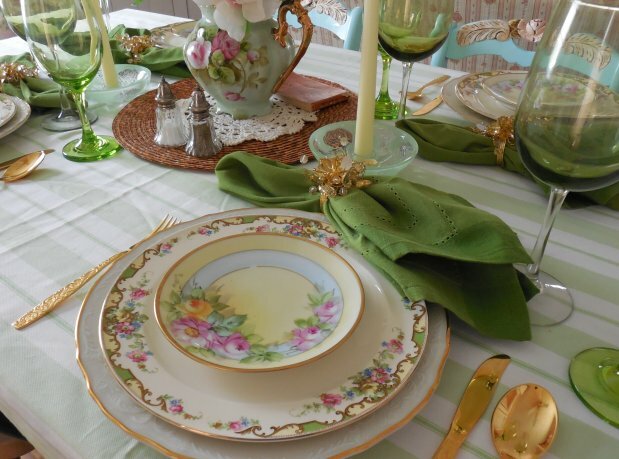 I especially love the plate stack on this table, but I think my favorite element is the centerpiece featuring that sunny yellow soup tureen! 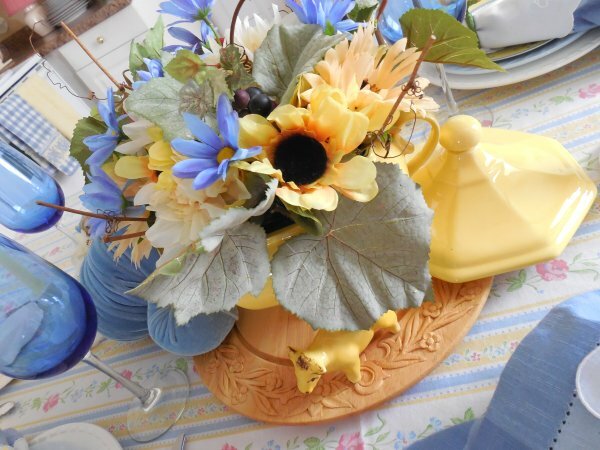 The soup tureen is the item that inspired this table – I loved its lovely yellow color and immediately pictured it at the center of a French-themed table. The entire arrangement sits on a wooden charger also found at Goodwill (I think it’s bamboo…?) 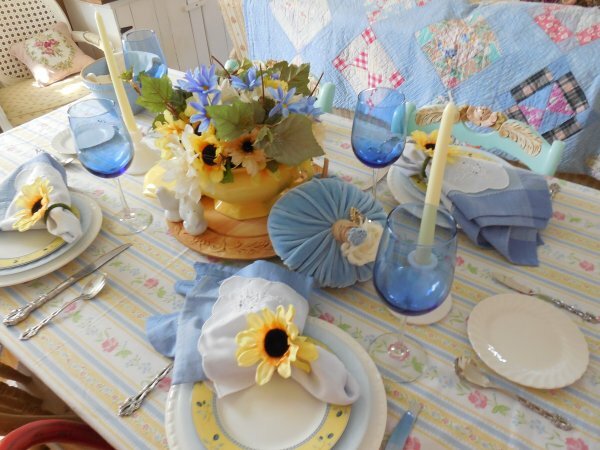 and includes an exuberant bouquet of blue, yellow and white silk flowers all from Dollar Tree, plus pieces from a silk grapevine spray found in another thrift store. 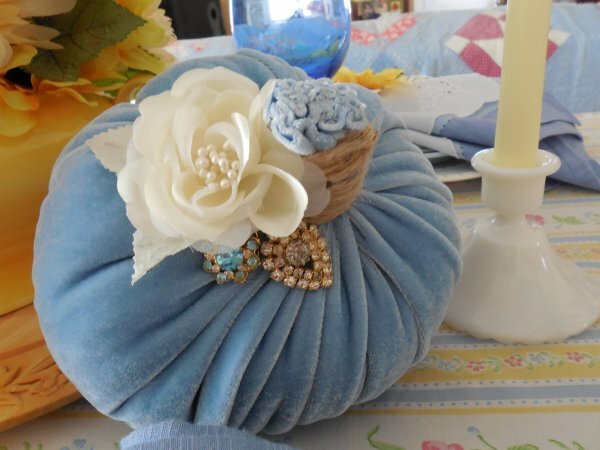 I’ve added two homemade blue velvet pumpkins (again because, why not – they’re blue!) 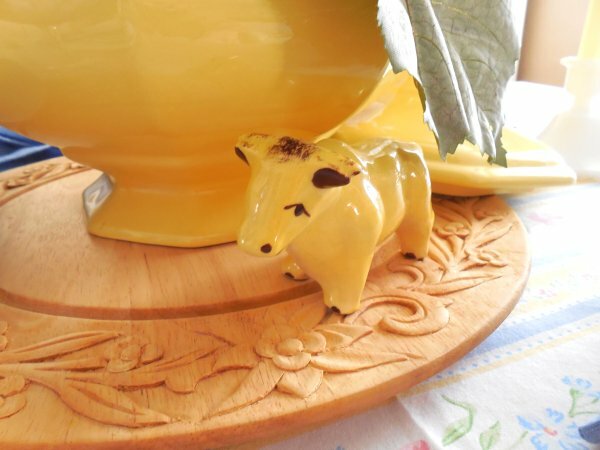 and a cute yellow ceramic cow who I think I heard mooing in French. 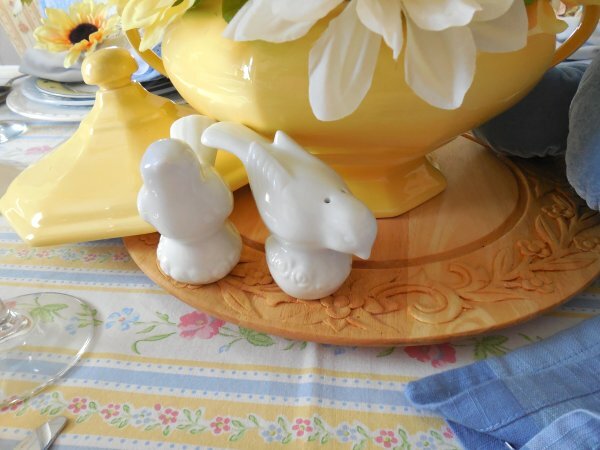 My sweet white bird salt and pepper set complete the centerpiece. 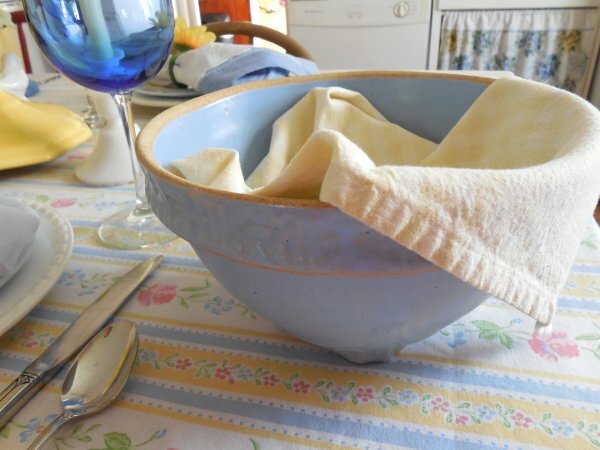 I don’t often include serving pieces in my tablescapes but I have this beautiful French-blue stoneware bowl that I think we could use to serve slices of homemade baguette. 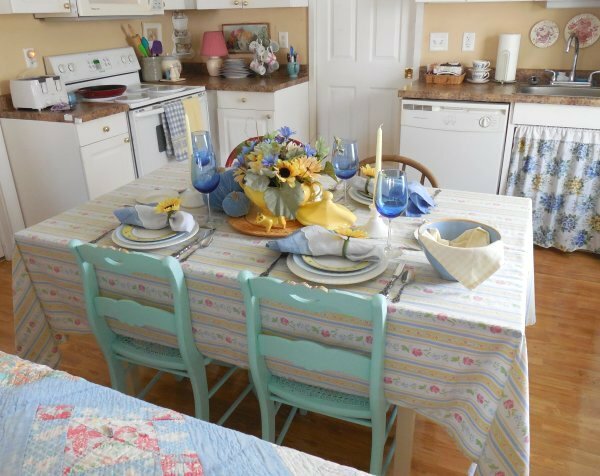 The yellow gingham napkin gives it a casual, straight-from-the-cottage-kitchen feel, don’t you think? 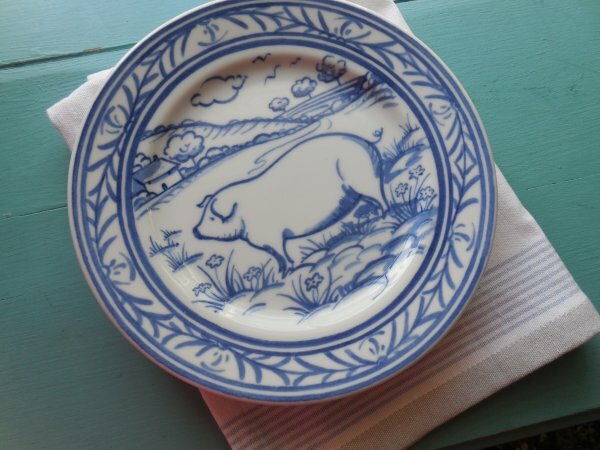 And, I also set out the dessert plates on the sideboard table – they are part of the “Farm Animals” set by Williams Sonoma, and again are in that lovely French blue color. 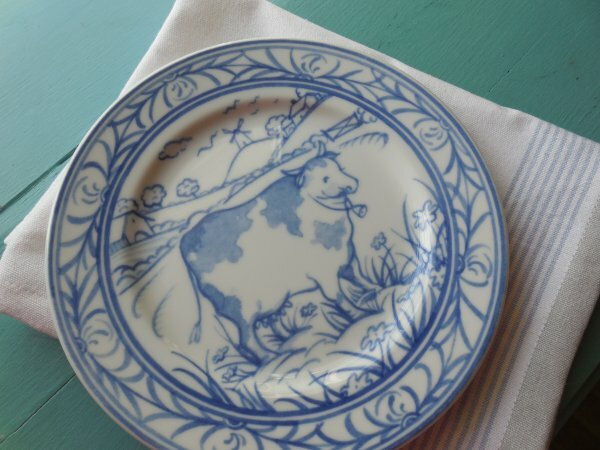 Maybe I’m imagining things, but I think the animals themselves also look a bit French! … and the put-away shot, with everything gathered up and ready to go back into the cupboards! 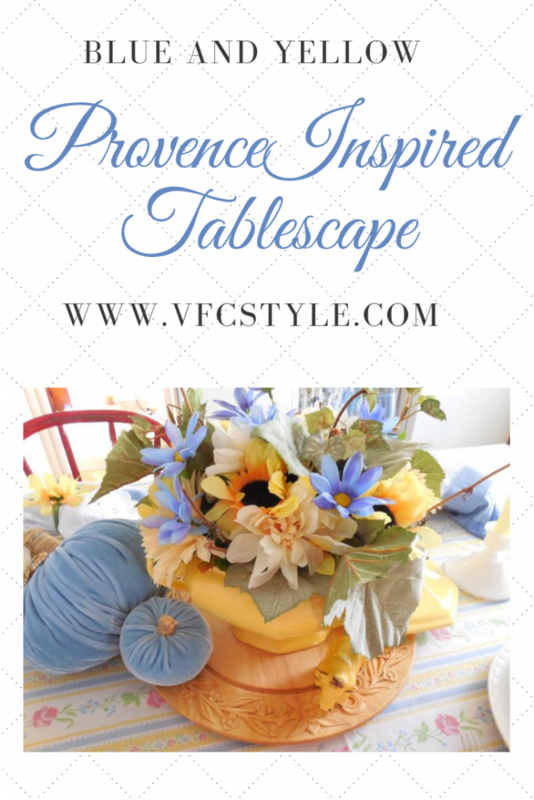 I’m including an image for Pinterest in case you would like to save my Provence-inspired blue and yellow table for future ideas! 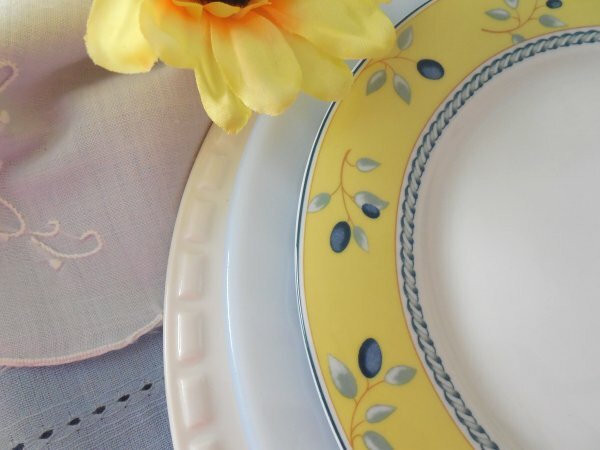 And of course, I’m sharing my post for Tablescape Thursday over at Between Naps on the Porch, still one of my all-time favorite blogs! Are you on Instagram? 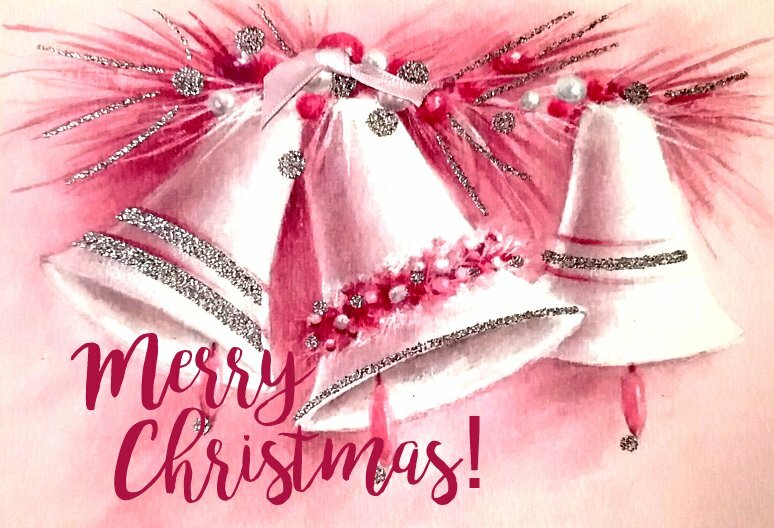 I made a concerted effort to learn and use this fun platform in 2018, with the wonderful result of becoming part of the large and friendly home decor community that participates and shares there. I also managed to grow my “following” from about 150 to over 2,500 online friends. I think this was primarily because I decided to focus my account on sharing home decor-related photos. This focus allowed me to define a potential audience for my account and seek out people with similar interests. 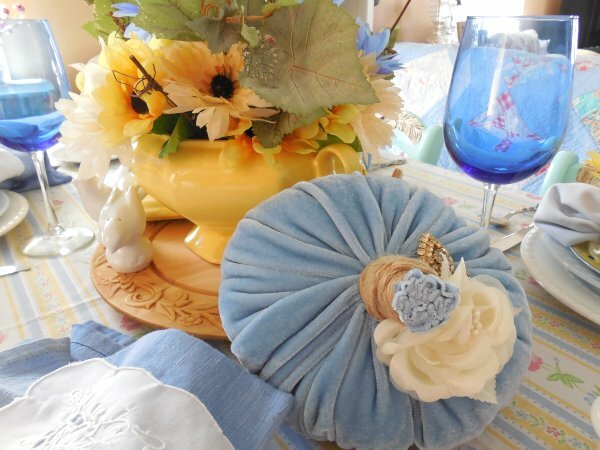 I also participated in decor-related activities such as give-aways and “follow trains” that drew like-minded people to my account and (happily) encouraged them to follow me. If you are curious to learn more, just leave me a comment and I’ll be happy to explain! And, click here if you would like to follow along too! 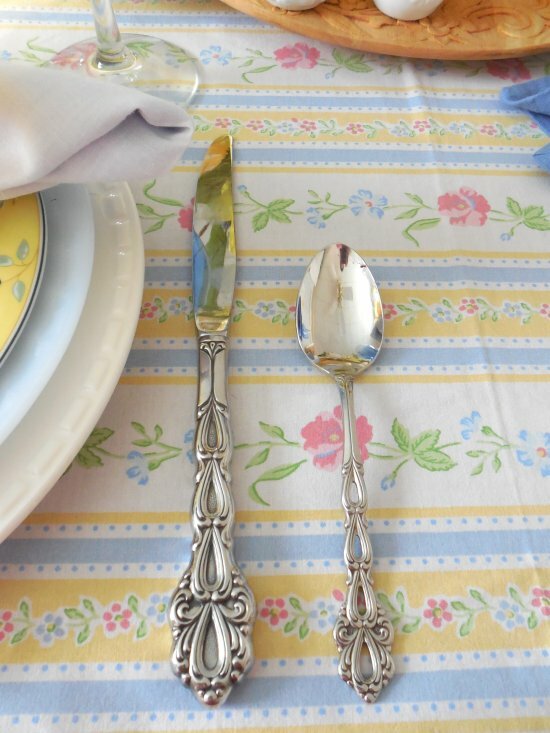 My handle on Instagram is simply @vintagefloralcottage ! Because of the growth in my account, it has been interesting and fun to look back over my almost 300 posts from 2018 and review what I shared. A lot of gals in the decor community do this with a “Top 9” app which ranks your nine most-liked and most-often-commented photos, but the app was kind of buggy for me so I decided to just create my own Top 9 grids which, together, give you a good idea of what life was like here in the dollhouse in 2018. Just for fun, here are the grids I created and posted. Together they make up my favorite photos that I shared on Instagram in 2018! 1. 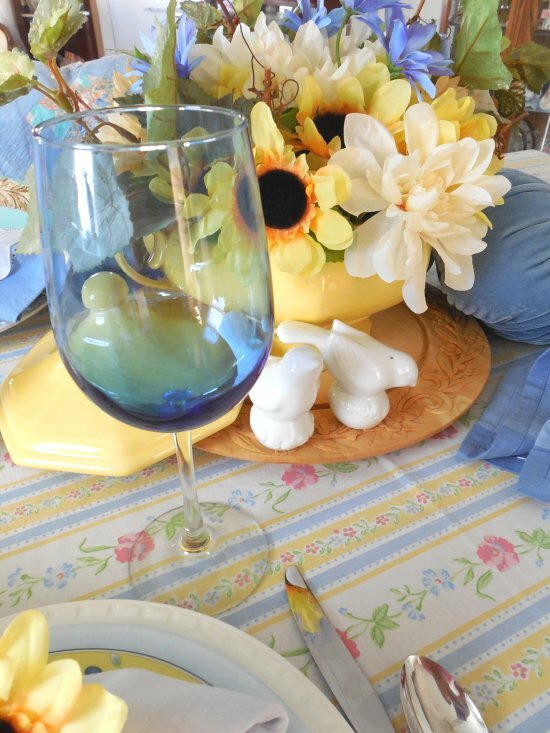 Top 9 pictures of dishes and tablescapes – bascially I shared a LOT of dishes and tablescapes! 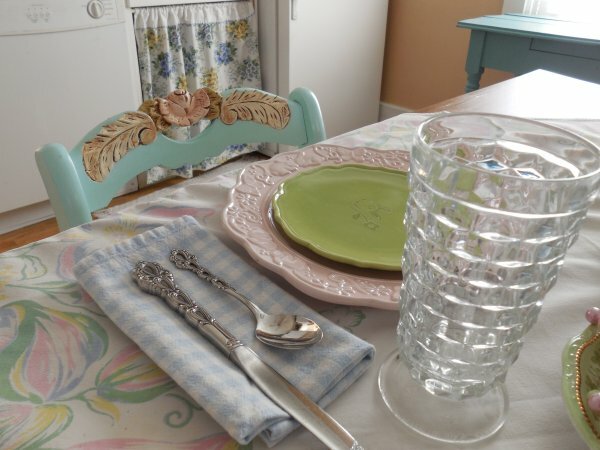 Anytime I brought home new dishes from Goodwill, any time I set a new pretty table, I snapped photos and shared at least one! These are just my nine favorite pictures – there are dozens more in my feed. 2. Top 9 pictures of my home decor. 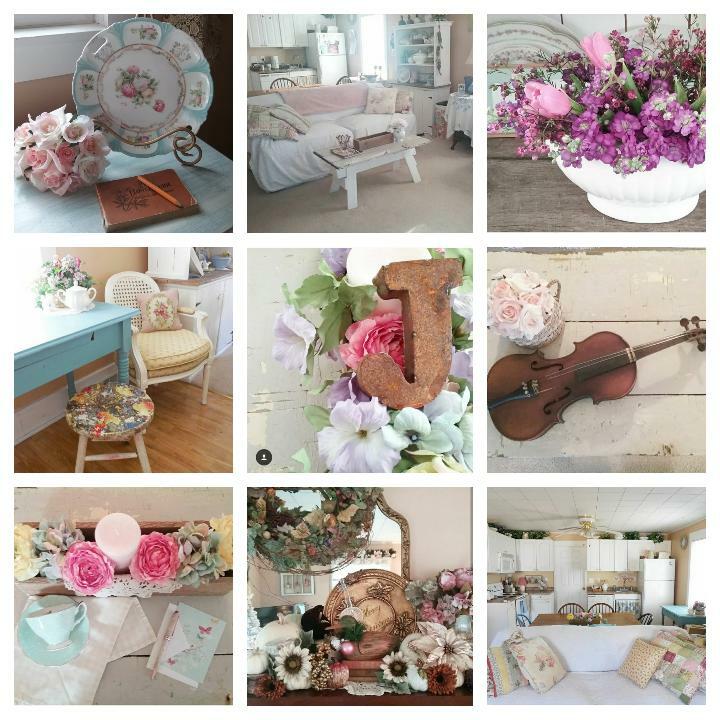 This grid more than anything shows me that I was able to really define and share my true decor style – Vintage Floral Cottage! 3. 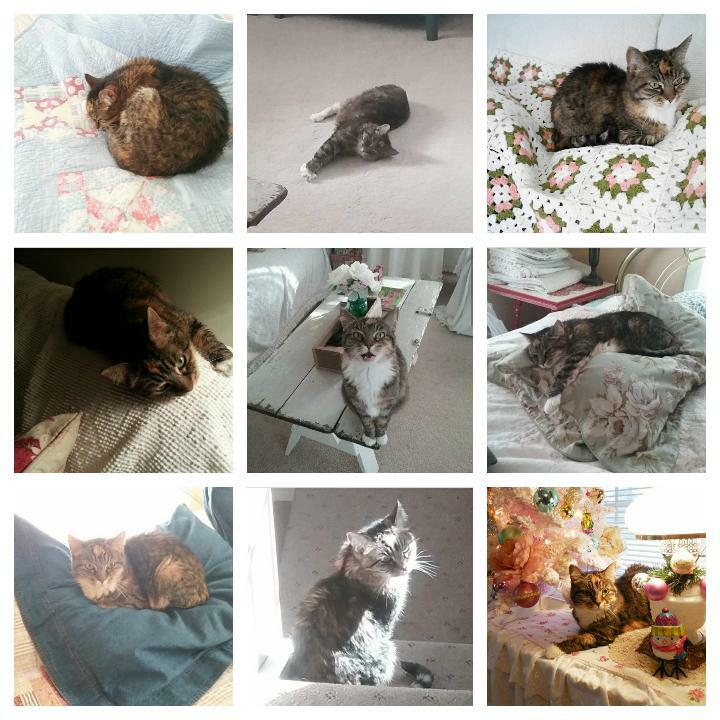 Top 9 pictures of Lily, my sweet cottage cat who obviously lives a very hard life “holding down the fort” in the dollhouse! Please come by and look me up on Instagram! I will still be there in 2019, sharing almost daily pictures that reflect my style, my dishes, and my cat! And maybe a few other random things too! Hope to see you there! Life threw me some curves this past year, including a broken ankle and a job loss, so although I wasn’t as consistent as I wanted to be in setting pretty tables, I did manage to do quite a few that I absolutely loved! 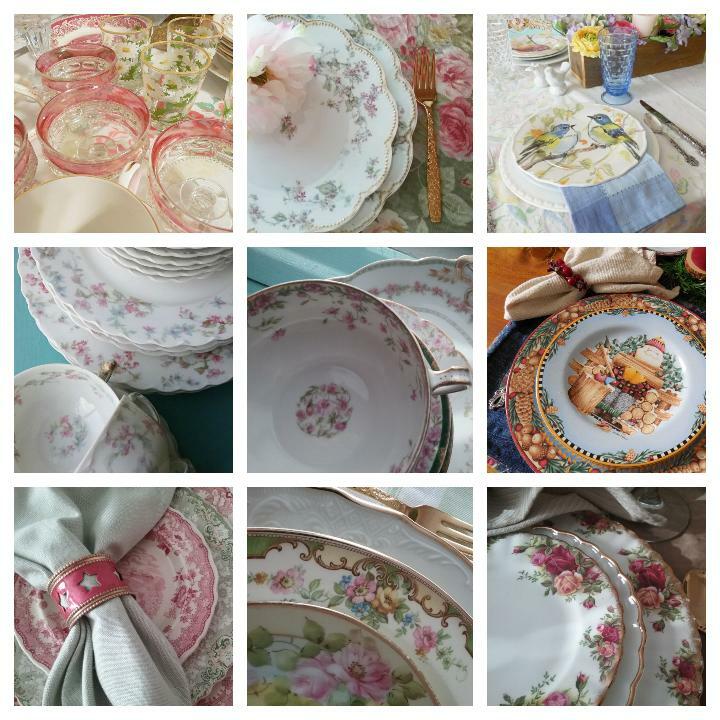 Just for fun, here’s a round-up of all the tables I did this year. 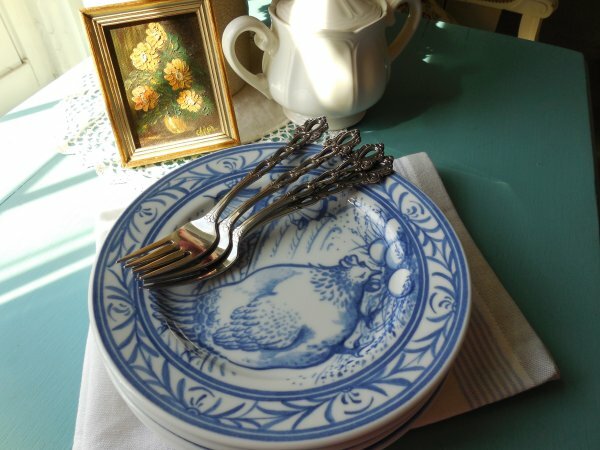 January: Blue & White Currier & Ives – the china from my childhood that was given to me by my grandmother! 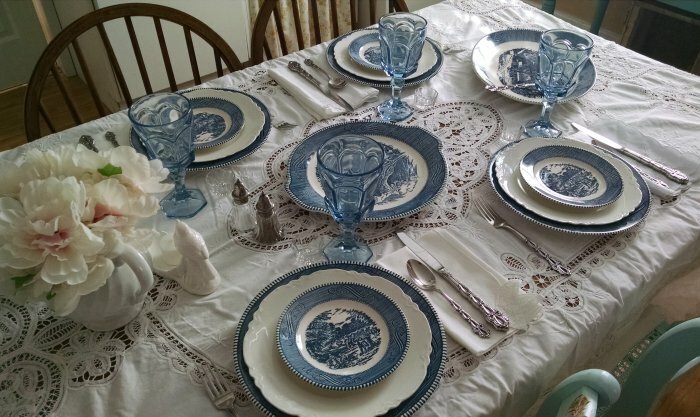 February: Ice Princess table using “Lisa” by Royal Doulton. 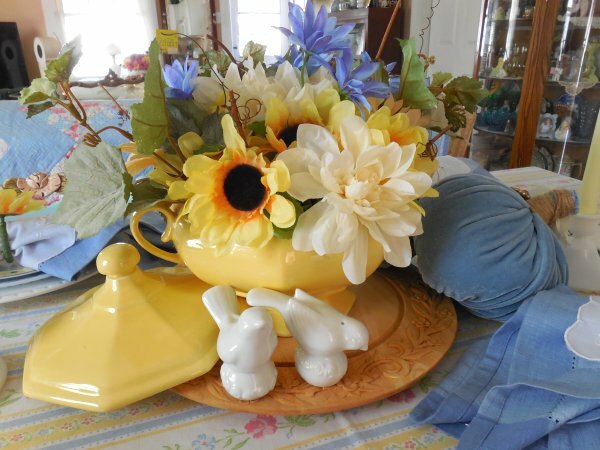 March: Pastel Spring table for two, using the cutest “chunky pottery” bunny plates and featuring a rather amazing spray of tulips! 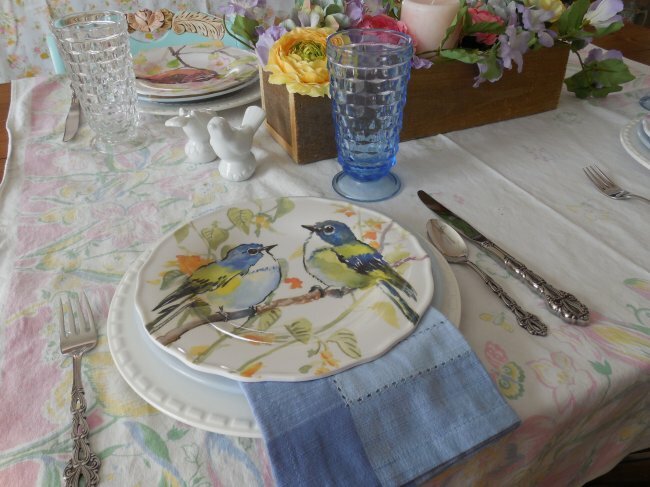 April: Spring Birds table featuring salad plate set from Pier 1. 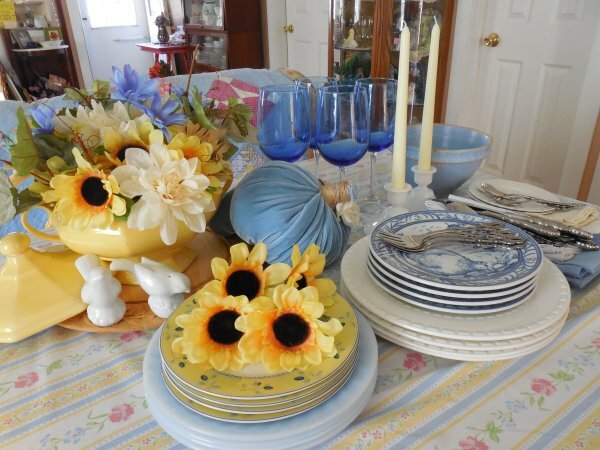 July: Summer Garden table featuring hand-painted plates from Bavaria, “Hostess” by Edwin Knowles, and “Formalities – Bernadotte” by Baum Brothers. 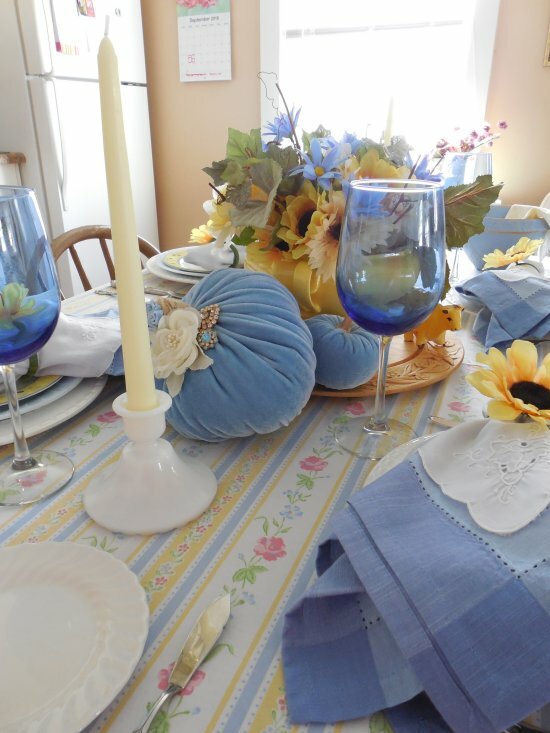 September: Faded Summer Early Fall table featuring hand-painted Haviland Limoges – one of many small sets that I own! 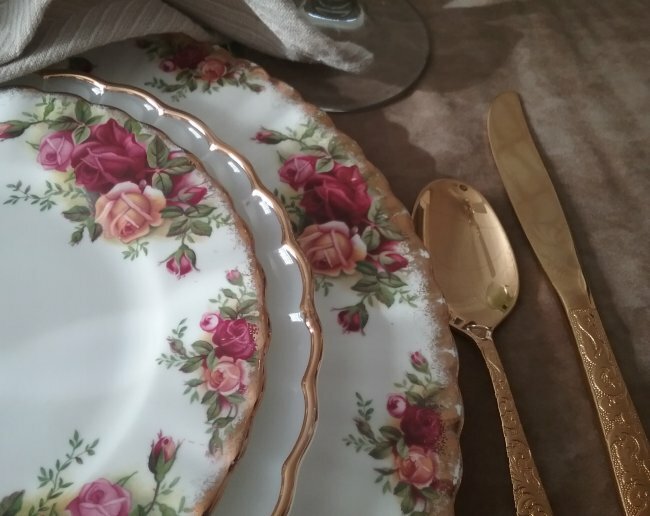 December: Thanksgiving Table with Old Country Roses by Royal Albert – my all-time favorite pattern. 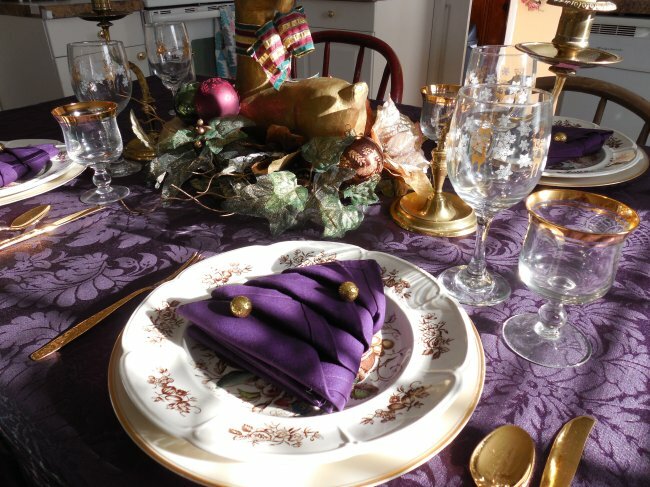 December: Elegant deep purple table featuring “Windsor Fruit” by Johnson Brothers. 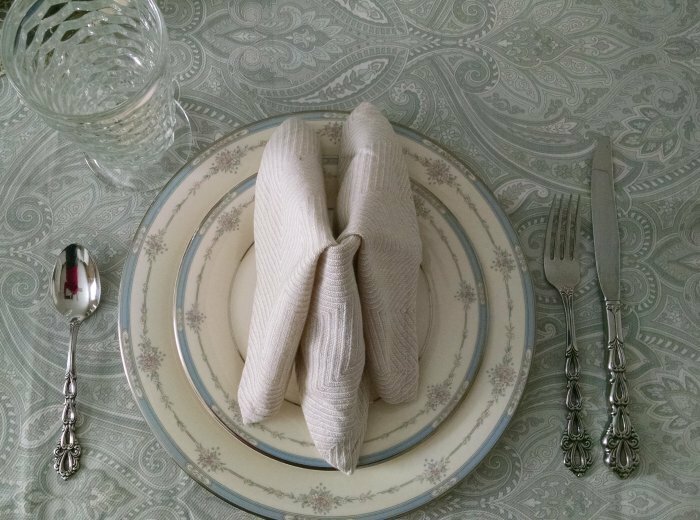 December: Red and Green Transferware luncheon table featuring antique English “Roxbury” by Meakin and “Shannondale” by Ridgways. 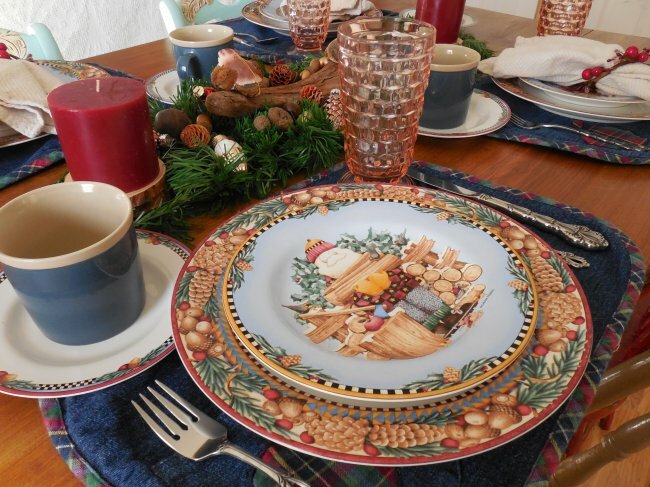 December: Woodsy table using “Woodland Santa” by Sakura, a coordinated set that features the artwork of Debbie Mumm. 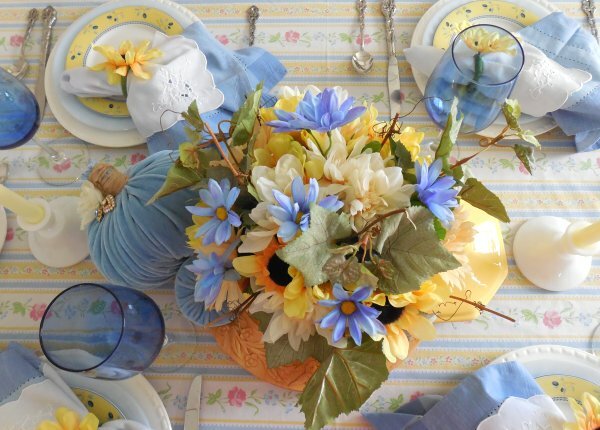 Thank you so much for reading and joining me this year for all these pretty tables! 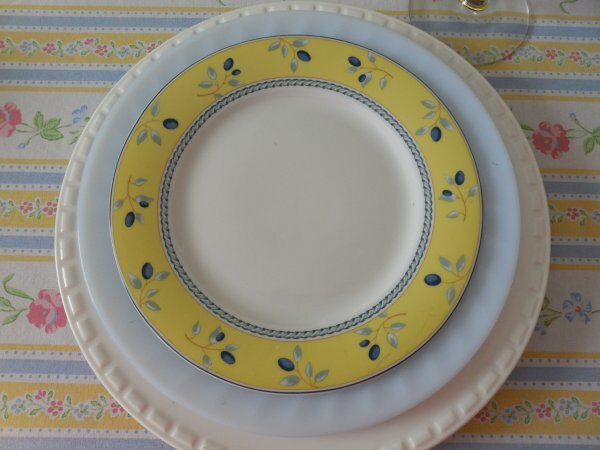 Your comments are always welcome, on these and any of the posts on this blog! 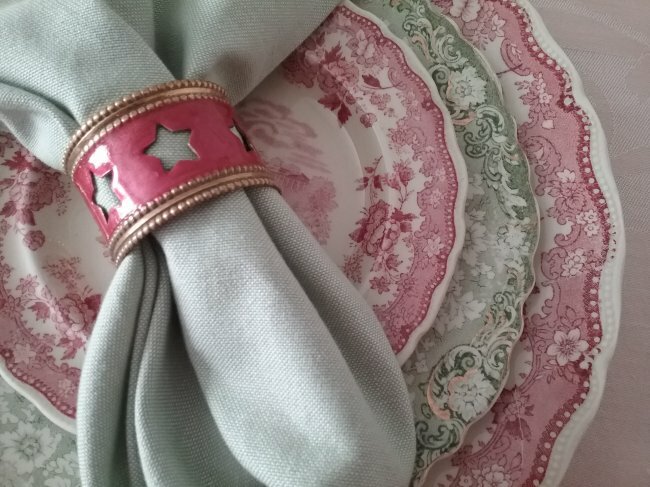 And, if you are a dish-a-holic like me, you will be glad to know that you can always come to this blog and check out ALL the pretty tables simply by clicking on the “Tablescapes” link over on the right-hand side of the blog in the Categories section. Super-simple, and keeps all the dishy goodness in one place! 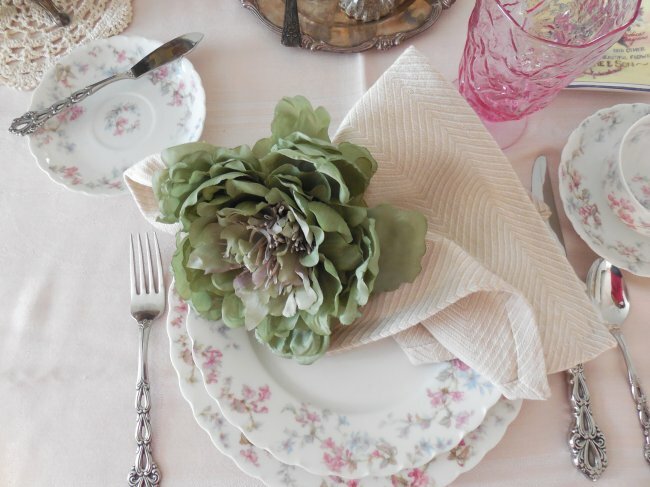 Here is an image to Pin in case you would like to save this tablescape round-up for future inspiration! 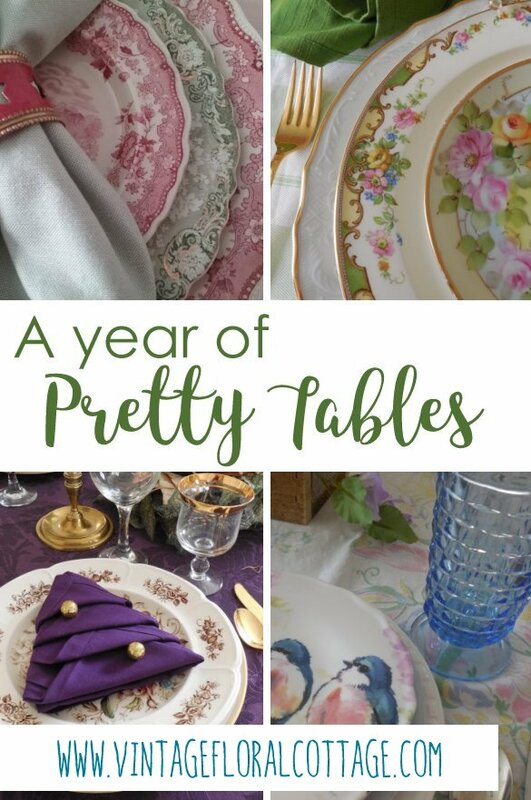 I’m sharing my collection of 2018 tables over at Between Naps on the Porch for Tablescape Thursday! Have you ever seen that “thing” going around where you adopt a word for the new year and you use it instead of New Year’s resolutions to sort of guide your decision-making or personal growth for the year? I tried it once with resounding success, but only because the word I chose was “imperfect.” It was pretty easy to find success with that one! I’m going to do things together more often with the people I love, the people who make me feel good, the people who can help me achieve my goals and whom I can help. I’m going to get my act together and find a real job, repair my financial situation before it gets completely out of hand, and start making smarter choices where my health is concerned. I’m going to bring others together by hosting more activities in my home, growing my Facebook group and other social media spaces, and generally try to be the catalyst for giving others positive experiences in person and online! How about you – do you have a word yet for 2019?